This is the initial screen of the app for user who are not already logged in / are completely new visitors. This screen is shown to all users upon logging in to the app. Users select which area they wish to focus on for the current session, they may come back to this screen at any time. This screen shows the available question formats, which would be combined into any order on the final product. Once the user has complete the questions they are taken to this screen where they are given advice based upon their 'score'. This project was completed for the Industry Project unit at Edith Cowan University. It was completed by my team and I for the Ngala group, from the initial client meeting until completion. We were required to produce a working prototype. Below follows the brief used to develop this project, as presented to the client. The product will present itself to its users in the form of a survey style questionnaire broken down into five sections; emotional health, diet, sleep, physical activity and social. 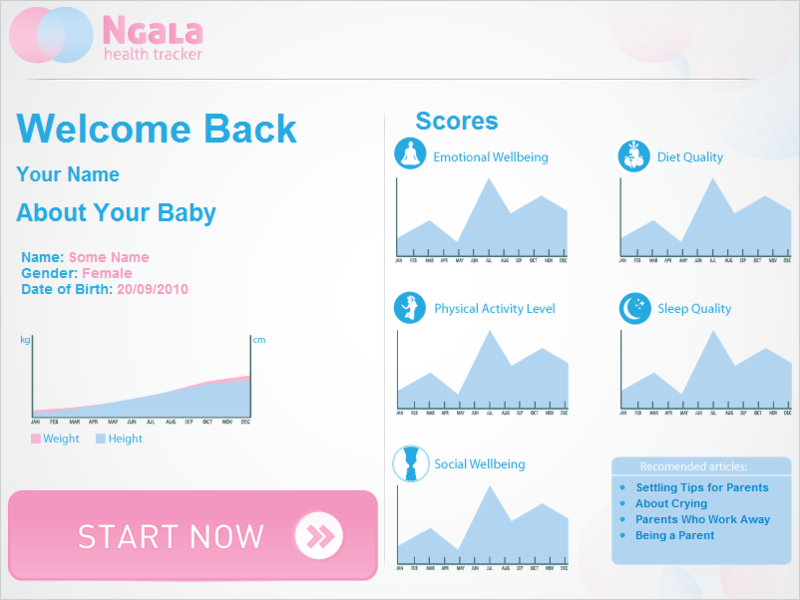 At the end of each section the tool will present the user with a motivational message based on their calculated self-care score. At this point the user will also be provided with links to some practical advice and other further information which is relevant to the user's characteristics (gender, life-stage and strengths/weaknesses in self-care). The user will not be required to complete the topics in any particular order, and may choose to only focus on one section – as time constraints involved in parenting may restrict the amount of time a user has to spend using such a tool. The tool must cater to this, by allowing a user to only complete one section, even on subsequent visits, and also by reminding a user that there are other sections and gently encouraging them to complete them.